Creating and evaluating neural networks is mostly composed of reading and writing values to arrays, so benchmarking array performance has been the first step towards optimizing the library. This method is generally frowned upon as its easier to make mistakes and its “harder to read”. In fact, w3schools says to avoid it outright! (see the When to Use Arrays? section.) However, for my Neural Network this method is way more efficient and faster! It turns out that V8 does a neat trick internally with an object’s hidden class when it sees a large array length. It switches from an array of unsigned integers, to a sparse array (i.e., map). In order to force this optimization you can manually set the length property. This is ONLY faster when working with large arrays: about 1000+. For smaller arrays it is only slightly slower, if not the same speed. Doing what you advise basically switches from a fast linear storage to a hash table. So yes you gain creation time as it doesn’t make sense to pre-allocate a hash table, basically the VM does nothing hence your perf boost. But then, the performance impact on further reads/writes is huge! To access a linear storage you only need the start memory address and the offset (index). This is a very cheap operation, this is fast. To access a hash map entry, you first need to compute the hash using a hashing function and then jump to the memory that holds the actual value. This is way more expensive. Great point and excellent article. I believe I pointed out that V8 switches to sparse arrays / maps if using the  / .length = N hack. Here are some more performance benchmarks geared towards sequential access, and storing numbers instead of strings or a mixture of types. 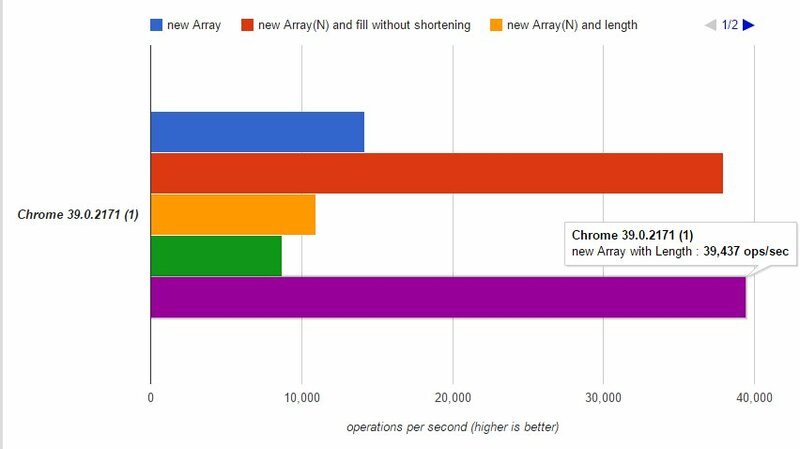 You’ll notice that the performance is almost identical between writing to the .length = N array and the new Array(N) one: http://jsperf.com/preallocating-array/15. I ultimately went with the pre-allocating the array new Array(N) in my Neural Network code as it consistently proved slightly faster not only in V8 but also in SpiderMonkey.